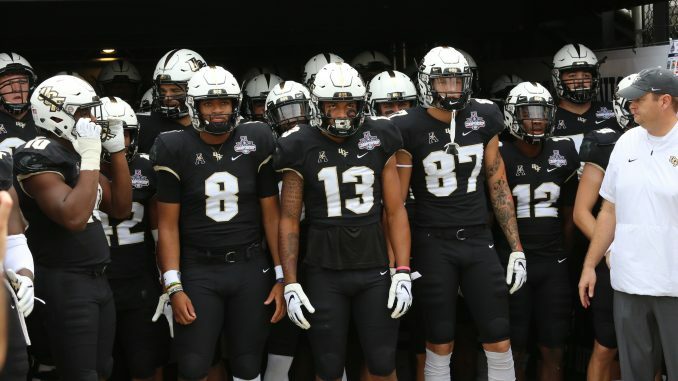 Going into the Fiesta Bowl, UCF had hopes of becoming the first team in more than 20 years to finish with consecutive undefeated seasons. But instead the Knights had no answers for LSU on either side of the ball, falling 40-32. It was the team’s first loss in more than two years. UCF got a scare early on when LSU returned the first kickoff of the game well within Knights territory. But the Tigers couldn’t capitalize on their great field position, as the UCF defense held firm to hold LSU to a field goal. After UCF’s offense moved down the field with ease and took the lead off a big run by Greg McCrae, the Knights’ defense once again came up big, when Brandon Moore picked off an LSU pass and returned it for a touchdown, building an early 14-3 lead for UCF and continuing an early dominant defensive performance. But the Tigers still managed to respond before the first quarter came to a close, cutting the lead to 14-10. The second quarter, however, proved to be disastrous for UCF. The offense simply couldn’t stay on the field for any length of time, facing immense pressure from LSU. The defense, meanwhile, continued to perform relatively well but couldn’t keep the Tigers off the board forever. LSU began to build up its lead as UCF continued to sputter offensively, eventually leading 24-14. But the Knights offense appeared to finally come to life at the end of the quarter, with Darriel Mack finding Gabe Davis with an amazing pass to score their first touchdown of the second quarter. UCF went into halftime trailing 24-21. Despite cutting into the lead, the third quarter was just as frustrating as the second for UCF. The Knights simply couldn’t do anything on offense and were shut down time and time again by LSU. Their only points of the quarter came off a muffed punt by LSU setting UCF up in front of the end zone. But even then, the Knights couldn’t pick up any yards and had to settle for a field goal. LSU’s offense showed no signs of slowing down, scoring 10 more points in the third to take a 10-point lead into the final quarter. Little changed for either team in the final quarter of the game as LSU continued to move down the field easily and UCF’s offense continued to struggle. The Knights went on to lose by eight. It was the team’s first loss since the 2016 Cure Bowl.